February 13th, 2018 — TRAXXALL Technologies, providers of an innovative aircraft maintenance tracking and inventory management system, today announced new client Heliservicio. 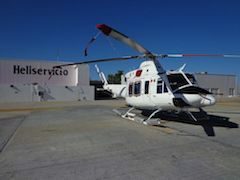 Heliservicio is a leading helicopter transportation company with more than 40 years of operating experience. The company specializes in offshore transportation for the international oil and gas industry. Operating a fleet of 22 Bell 412 EP and 429 intermediate helicopters, Heliservicio’s experienced pilots are supported by skilled technicians and a state-of-the-art operations and logistics center. Last year, Heliservicio began an assessment of all available aircraft maintenance tracking systems. At the end of this process, the company selected TRAXXALL for the maintenance tracking of its entire fleet. TRAXXALL delivers the most innovative aircraft maintenance tracking and inventory management system on the market today. Founded by established maintenance tracking experts, TRAXXALL is headquartered in Montreal, Canada, with offices in Jacksonville, FL; Wichita, KS and London, UK. For more information, please visit www.traxxall.com. To download our helicopter brochure, please complete and submit the form below. Which helicopter models do you own, operate or maintain?